Since I've had a few requests for a look with red lips, and also for a "Roaring 20's" look, I thought I would post up some photos of a look I did a few weeks ago for a photoshoot. I was channeling my inner vintage pin-up for this look and I was pretty happy with the results. Now, a true 20's flapper-style look was a little more edgy than the previous woman at the time. She was young, maybe 19, and loved to be adventurous and a little bit scandalous. She cut off her hair, wore felt caps and loose shift dresses, and LOVED makeup! Lots of black eyeliner, and bright red lips. She was one fierce woman! To translate that into today's world, it's actually very simple with flawless skin, neutral eyes, and a strong red lip. I used MAC Studio Sculpt foundation in NC30 with the Revlon colorstay eyeshadow quad in Copper Spice. If you have never tried eyeshadows, this is THE shadow I recommend you start out with. It has ever shade you need from highlighter to lid to contour and you can wear it from sheer to smokey. I love it and it is still one I grab every once in a while for a nice work-appropriate look. Anyway, getting back on topic, what really makes the vintage look is the false eyelashes, winged black liner, filled-in brows, and strong red lips. I used MAC fluidline in blacktrack for the eyeliner and NYX Round Lipstick in Snow White (my perfect red shade!) You'll have to forgive my pictures since I took them after the shoot and my makeup wasn't as perfect as when I applied, but you'll get the idea. A close-up of the shadow. This shows the color slightly more accurately. Look how white the red lipstick makes my teeth look! And a few more in natural light. 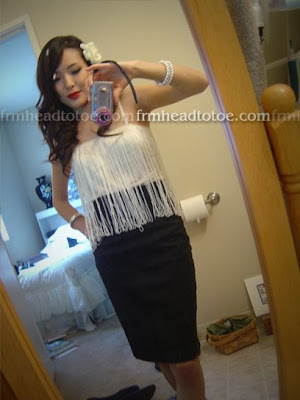 As for my outfit, the fringe top is from Urban Outfitters and the pencil skirt and hair flower are from Forever 21. I love the lipstick shade! I was thinking about buying that too during the NYX sale. You're so adorable and really gorgeous! This look suits you really well actually; I love those red lips! you are beautifuL! love the red lips on you, and i loove the outfit! Red looks so pretty on you! I haven't found my red yet. Can't wait for the pictures from the photoshoot :) AND you look gorgeous, although this look cannot suit everyone it looks amazing on you. i always had a the belief that red lips didn't go well with our asian faces but you really made it work! you look great! also how do you keep your teeth so white! I was just wondering, have you ever thought about getting double eyelid surgery, instead of wearing the tapes every day? Because I also wear tapes quite often and when I'm older im thinking about getting the surgery, and I just wanted to know what you thought about the surgery. I know people may not agree with me but, I always thought that you looked so much like Kiera Knightley. I think it's because you both have very similar face structure/shape. Has anyone every told you that before? oOoOo! i've been MIA~!! hehe but i LOVEE this look that you did! only you could pull off the bold, red lips like that! i wish i could...well, i've never tried red lipstick >:P hehe but every girl should have at least 1 red lipstick in her makeup collection, so maybe I should look into getting one--just in case! ;P hehe why are you sooo gorgeous!! This is a nice look! You look great in this! Red lipstick, I want to wear it to prom but my friend says that red lipstick doesn't look good on tiny lips. I have medium sized ones. Does it matter? I was planning to wear red lipstick for prom but my friends says that it wouldn't look good on small lips. I have medium, while she has full ones. Does it matter?